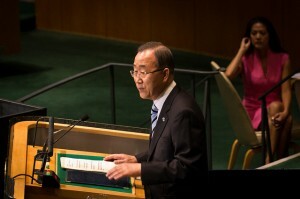 UN Secretary General Ban Ki-moon has praised the initiatives of HM King Mohammed VI in favor of peace, stability and harmony in several African countries, particularly in the Sahel. HM King Mohammed VI, Commander of the Faithful, has agreed to a request by the Nigerian Islamic Council and Iftaa Authority for training Nigerian imams in Morocco. In the Sahel, Ban Ki-moon also called for a “regional and global commitment” to “get (the countries of this region) out of the cycle of chronic crises” and hailed Morocco’s initiatives in this respect. Ban Ki-Moon praised the initiatives and efforts made by countries like Morocco, citing in this regard, “the Rabat meeting to promote transnational cooperation”. Similarly, in Central Africa, Ban Ki-moon said he “counts on” the professionalism, integrity and commitment of Moroccan troops to achieve stability in Central Africa. Morocco is also one of the first countries to have deployed troops in the United Nations Multidimensional Integrated Stabilization Mission in the Central African Republic (MINUSCA), he said. The UN Chief also expressed his “recognition” to Morocco, the 15th largest contributor to UN peacekeeping operations, for its “commitment with us”, from the Democratic Republic of Congo to Côte d’Ivoire. Regarding Ebola outbreak, Ban Ki-moon praised “the approach of Royal Air Morocco and the Moroccan authorities” which have decided to maintain their flights to the epidemic-affected countries.